And Here I Am Putting On Socks With My Bare Hands Like A Sucker… | OhGizmo! Of everything the internet has done for me, like helping me get into, and then out of, that wacky cult, this discovery is by far the best thing it’s ever brought into my life. For years I’ve grimaced, gagged and shuddered every time I’ve accidentally touched my feet when putting on socks, but those sad, sad days are over. Once again a useful gadget designed to make life easier for the injured, disabled and elderly will help me overcome another bizarre fear and/or phobia. 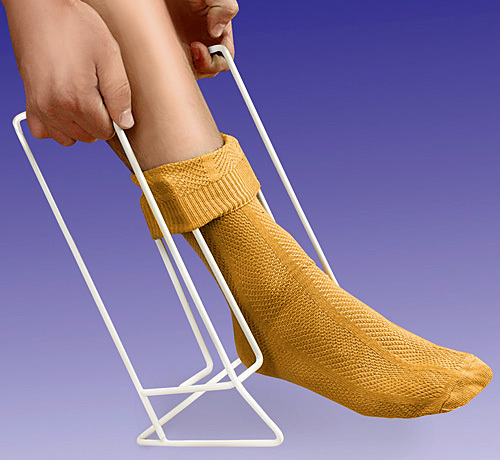 Once you’ve slid your sock onto the wire rack support, you just stick your foot in as usual and then use the generous extension handles on either side to pull it all the way up your leg. I’ve just realized it will even reduce the amount of bending I have to do every day, which is a whole other phobia we won’t get into right now. What’s most amazing is that this miracle contraption is just $14.98. Little do they know I’d happily pay up to $18 for something as life changing as this, but don’t tell them that! Agreed. I'm not sure it's that cool to make fun of people who need things like this because they have no other way of putting on their socks without help. Aids like this are innovative and allow people to be more independent. You're soooo right. I'm not sure why anybody would ever make light of anything or make a harmless joke!!! We need to start taking these blogs much more seriously – ya know, like a medical journal. …and before you freak out, my grandmother could use something like this, but that doesn't mean you can't find humor in it.